Back in February, at an Iowa state dinner held in his honor, Chinese Vice President Xi Jinping offered what the Des Moines Register described as a heartfelt toast to the Hawkeye state. 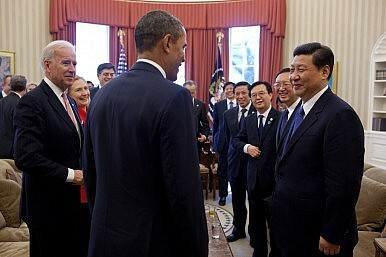 Xi, who a quarter century before had visited Iowa as a local official, returned in 2012 as a national leader aiming for greater global exposure. In the presence of Iowa’s leading citizens, Xi shared his childhood memories reading Mark Twain and his long-held fascination with the Mississippi. And so he was glad that, on this most recent trip, “the unequaled beauty of Muscatine at sunset” had greeted him once again. The man who charmed the heartland of America will, at the 18th Party Congress in Beijing this coming October, officially become the President of China. As China’s international profile continues to rise in tandem with its economic and political significance, one might conclude that the Chinese public is likely to expect Xi to carry a higher profile on the international stage. As the leader of a world power, Xi will have to devote more time to international affairs, take the lead in debates on global issues, interact more frequently with foreign audiences like the citizens of Iowa, and articulate China’s role as a shaper of world affairs. In reality, however, Xi may be preoccupied with addressing a host of economic and social challenges that China is likely to encounter in the decade ahead. As China’s next leader, one of Xi’s main concerns will be managing the significant economic challenges that are beginning to surface. In particular, Xi will have to shepherd his country through the most turbulent part of its gradual transition from an export-oriented economy to one that is based more on domestic consumption. For the past 30 years, low-wages and an abundance of able-bodied young workers has given Chinese manufacturing a huge comparative advantage and enabled its expansion. In recent years, however, China’s economic model had become increasingly problematic. As consumers in Europe, Japan, and the United States, saddled with economic challenges at home, reduced their consumption, an export-centered economy has proven to be unsustainable, with unsold goods—everything from toys to automobiles—reportedly piling up on factory floors and showrooms across the country. Chinese wages, once the country’s greatest assets in attracting manufacturing, have been rising for years, leading some, like Boston Consulting Group, to predict that there will be a “manufacturing renaissance” in the United States. Meanwhile, should conditions continue to deteriorate and unemployment rise throughout China, the government will be particularly worried about social unrest, as was the case during the early stages of the global financial crisis that began in 2008. How Much Slowdown Can Beijing Tolerate? The notion of a bottom line for growth and stability is a myth. The truth is more complex.